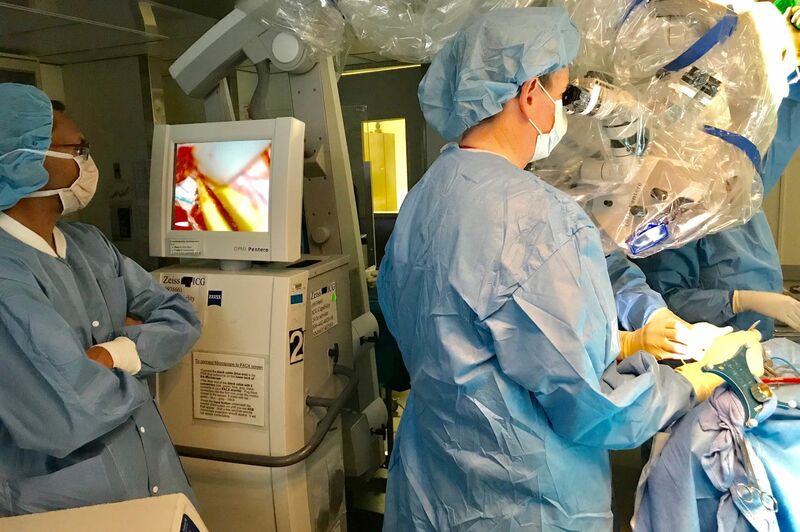 Michael Schulder, MD, and colleagues performed New York State's first intraoperative radiotherapy case to treat aggressive brain cancer. The other group will receive standard of care and IORT, in which the neurosurgeon first removes the brain tumor in the same way that is traditionally done with a craniotomy. Following the tumor resection, the radiation oncologist inserts a mobile X-ray device – the Intrabeam System – into the skull, allowing for high doses of radiation to be delivered directly to the tumor site. The radiation process can take approximately 20-60 minutes. After radiotherapy is completed, the device is removed and the surgeon closes the site. Patients have recovered from this procedure just as well as after conventional brain tumor removal. Approximately five weeks after surgery, the normal standard of care of chemotherapy and radiation is also given. For more information about this research study, contact NSUH’s Louise Anne Purcell, MS, ANP-C, at (516) 941-1263 or email at [email protected]. For the research study at Lenox Hill Hospital, contact Tamika Wong, MPH, at (212) 434-4836 or email at [email protected].